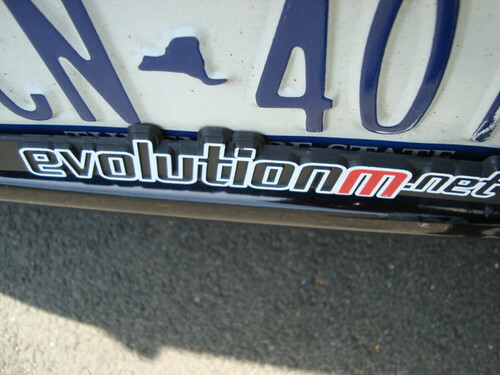 evolutionM.net license plate frames PLEASE! buddy sent out his fram for a mold. Yeah, frame is out. They got it at 4:30 today. They will call me tomorrow with exact details and timeline. Sounds good! If all goes well, hit me up. I want two plates to replace my ghey' stock dealer frames. I've got a mint one from a few years back. Hey guys, since I really haven't seen the original version on the first plates, I made this copy.. tell me what you think. Also, you can edit this to what you like and make your own copy, all is good. But if you want an original, it's fine. Here's my blacked out plate frame. The original painted letters were fading so I just sanded the paint off and sprayed it with a little clear coat. ^^^^^^^^ looks good but I'd rather have it in color. Just got off the phone. They are coming up with different options for me. The machine work for the outlined letters are what is holding them up. They will get back to me hopefully today with news. Last edited by 4RETECH; Jun 7, 2011 at 09:15 AM. See if you can get them maybe 1/8" bigger all around. My plate was a pretty tight fit. Can't wait to see a finished product. I'm buying 2 for sure. booooo that company. I want original, not different options. I'll take two when/if they get made. They are getting made. My frame is at the set up facility tomorrow. It will take 4 days for the proof to come in. And then up to 4 weeks to be done. 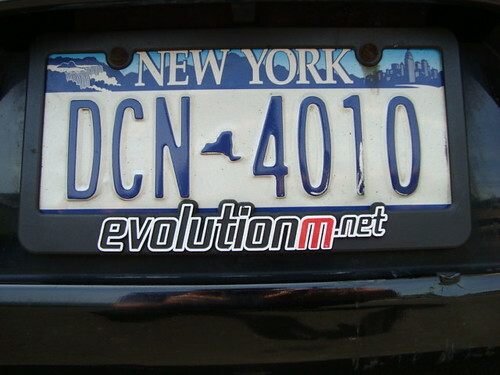 Quick Reply: evolutionM.net license plate frames PLEASE!